Ph.D. in Social Work is a 2-3 years’ doctorate degree program, the minimum eligibility is master degree in the Social Work from a recognized college or university or its equivalent exam. The average tuition fee charged for Ph.D. in Social Work program in India ranges between INR 1,000 to 2 lacs. For admission to Ph.D. in Social Work course relies on basis of candidate's performance in a relevant entrance test, and resulting round of counseling. The doctoral program is interested in candidates who have critical thinking skills, intellectual capacity, and potential for research and scholarship. Ph.D. in Social Work goes for training experts and professionals in the skills, abilities, and competence identified with the precise examination of different issues and issues in the territory of Social Work. At this level, the examination is based on giving new and unique experiences into the issue or the range under scrutiny. 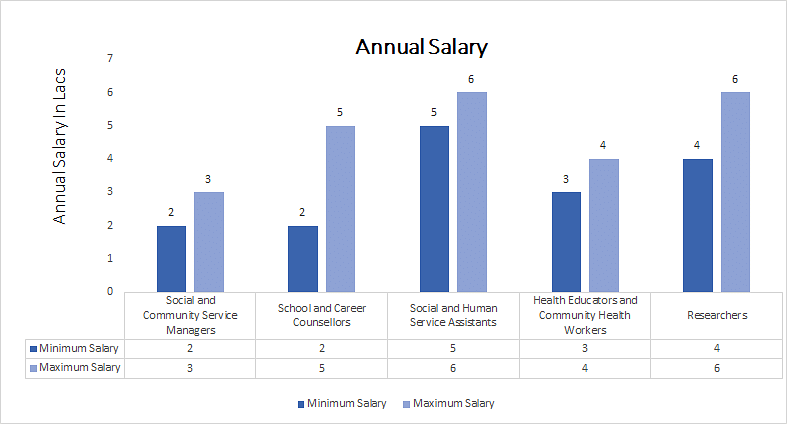 Such postgraduates are hired in capacities such as Lecturer & Professor, Social and Community Service Manager, School, and Career Counsellor, Social and Human Service Assistant, Health Educator and Community Health Workers, Teachers and Researchers, Human Services Worker, Novelist, Writer or Editor, Journalist, Philosophical Journalist, Researcher, Scientist. Development and Test Engineer, Electrical Product Design Engineer, Engineering Technologist, Independent Consultant, Consultant etc. The average salary of the candidates in this field is INR 4,50,000. Top Recruiting Companies Watson Envirotech private limited, Narayana Hrudyalaya, Taurus, green health trans logistics private limited etc. Top Job Areas Educational Institutes, Human Services Industry, Publishing Houses, Newspapers, Magazines, Philosophical Journals, Research Institutes, Consultancy Services, Law Firms etc. Top Job Positions Lecturer & Professor, Social and Community Service Manager, School and Career Counsellor, Social and Human Service Assistant, Health Educator and Community Health Workers, Teachers and Researchers, Human Services Worker, Novelist, Writer or Editor, Journalist, Philosophical Journalist, Researcher, Scientist. Development and Test Engineer, Electrical Product Design Engineer, Engineering Technologist, Independent Consultant, Consultant etc. Ph.D. in Social Work: What is it all about? Ph.D. in Social Work course teaches different services intended to help poor people and matured and to expand their welfare. Social Work is both an expert and scholarly course whose region of study is planned for enhancing the personal satisfaction of an individual, group or community having a place with a weaker segment. Ph.D. in Social Work is gone for training individuals who are now working or want to work in the Development and Welfare segments. Ph.D. helps a candidate to become a Social Worker and perform in different capacities. Social workers perform interventions by policy, research, direct practice, community organizing and teaching. Applicants who are energetic about contributing unique and original knowledge in the field of social work are the most suited for this course. One ought to have a profound and broad viewpoint towards the subject to fulfill a work of research. Ph.D. is also appropriate for the individuals who need to put in a couple of years more as an understudy. People who need to seek a career as a college professor or researcher in a field can enroll in any of the colleges or institutes offering a doctor of philosophy degree. A Master’s degree in Social Work is required for admitted into a doctoral program. In some subjects, doing a Masters in Philosophy (M.Phil.) is necessary to start Ph.D. Admission is based on an interview held typically a month prior to the beginning of the semester. The interview might be supplemented by an entrance test, if necessary. A year- wise break up of the course’s syllabus is tabulated below. The field of social work has over various career options, based on the type of social work program you seek and your personal career objectives and interests. Numerous candidates choose a social work career depending upon the types of people they want to help and the work environment they prefer. Many social workers give clinical and case management services specifically to individuals and groups. Social workers serve customers dealing with a range of difficulties including poverty, addiction, physical and mental health problems and family issues. Some social specialists don't work straightforwardly with individual customers. Rather, they work in group associations, government, and advocacy groups to alleviate poverty and social foul play on a major-picture level. These social work careers incorporate policy analysis, legislative advocacy and community organizing to break down barriers and drive change.